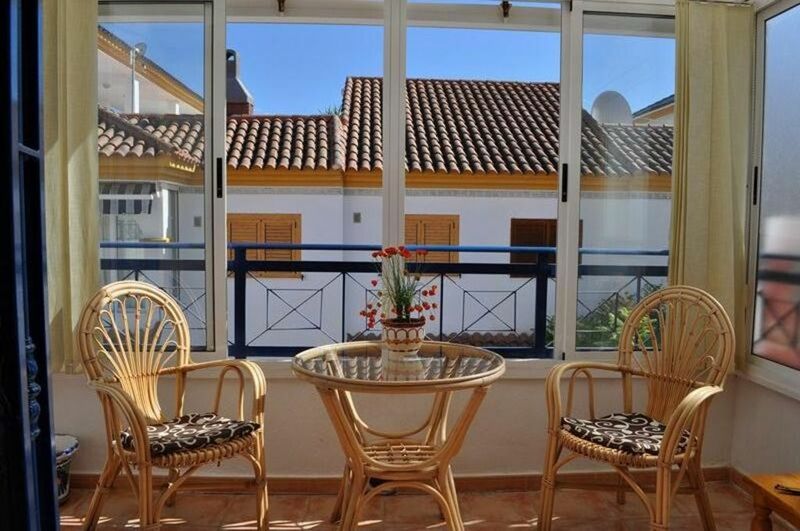 2 bedroom apartment in Torre de la Horadada, Costa Blanca, Spain (sleeps 4/5 people). Modern, spacious and air conditioned 2 bedroom, first floor apartment. Overlooking the communal pool. 15 minutes walk to beautiful, blue flag beach of Mil Palmeras, many more within easy reach. Walking distance of bars, restaurants and supermarket. 20 min from Murcia airport, 45 minutes from Alicante airport. Free WIFI. Main bedroom has a double bed and built in wardrobe with chest of drawers. Second bedroom has two single beds, chest of drawers and built in wardrobe. Both bedrooms have mirrors. Generous sized, tiled bathroom with toilet, sink and bath. A fully furnished, modern kitchen with cooker/hob, fridge freezer, microwave, kettle, toaster, pots, utensils and cutlery. Lovely living room with a comfortable sofa bed, dining table and 4 chairs, tv, dvd player (variety of CDs and DVDs),books, free WIFI. There are toys, books and DVDs available for children's use. A pleasant terrace with a table and four chairs, ideal for having meals. Cleaning is carried out by owners after quests leave at cost of 50 Euros(to be left in the apartment at the end of stay). Bed linen and towels are included. Cleaning mid stay can be arranged for additional cost. The apartment is suitable for year round renting. It is perfect for families as it provides peaceful and attractive location. Winter lets are also available ,as the apartment has an electric radiator and duvets. Short stays and discounts in quiet months are also possible, however contact the owners. Due to the steps to the property, we regret this property is not suitable for anyone with mobility difficulties. There is a lovely terrace overlooking the communal pool and garden. There are 4 excellent golf courses within 15 minutes drive: Las Colinas, Las Rambles, Campoamor and Vilamartin. Murcia airport is 25 minutes drive away and Alicante airport is 45 minutes drive away from the apartment. Car hire is available at both airports. It is not essential, however if you wish to explore further afield it is recommended. The village of Mil Palmeras is 15 minutes walk from the apartment. It has a little square and a great 'restaurant alley' which is packed with international restaurants specialising in their own cuisine. The promenade,runs the length of the beach and takes you north to Dehesa de Campoamor or south to Torre de la Horadada. The visits to Torrevieja, Murcia, Alicante ,Cartagena or Sierra de Espuna are highly recommended. Mil Palmeras has a magnificent beach, depending on the time of the year it ranges in width, although the fine golden sand is always guaranteed. Mil Palmeras literally means thousand palms, and it is a quiet coastal village . There is a Friday morning street market in nearby Pilar de la Horadada where you can buy local produce. Torre de la Horadada is also one of the prettiest of the southern resorts with attractive coastline and seafront walks as well as a charismatic watch tower dating from the time when pirates sailed these seas, numerous sandy beaches, sunny weather and a delightful marina with plenty of mooring space. Torre de la Horadada/Mil Palmeras weather has a Mediterranean climate meaning that there are three hundred days of sunshine annually, a guarantee of no rain in the summer months, and mild winters with a little rainfall. A 50%,non-refundable deposit is required to secure the booking with the remainder payable 8 weeks prior to your arrival. If the booking is less than 8 weeks away, the full amount is payable at the time of booking. A £150 refundable ,security deposit will be returned subject to confirmation that there is no breakages/damages other than normal wear&tear and safe return of keys. Cleaning is carried out by owners after quests leave at cost of 50 Euros(to be left in the apartment at the end of the stay). Please contact the owner about the changeover days, arrival and departure times. Hi, we are a friendly family living in London however count Spain as our second home! We try to get out to our apartment at every opportunity. We speak English, Polish and some Spanish. We bought our apartment so that we had a safe and beautiful environment to holiday in once we had children. We chose Mil Palmeras as it is only 2 minutes drive from the beautiful beach, but in a quiet location - so we get some much needed peace! We also wanted a 'home from home' where we could keep returning and never run out of things to do or see! We arrive somewhere familiar knowing that it is safe and clean. The holiday starts the second we arrive! Magnificent beaches, close to restaurants and airports. Perfect for cycling, walking and swimming. There is a dining table in the living room with for chairs, however more can be brought form the terrace. Nice,tidy apartment with everything you could possibly need in beautiful surroundings.Very good location,near to main roads,airports,shops,beach and restaurants.The pool is well maintained and looked after.The beaches are clean and beautiful. Very good communication with the owner who responds quickly. WELL APPOINTED.A FEW MINOR NIGGLES BUT WOULD CERTAINLY COME BACK AGAIN. WE FOUND THE APARTMENT CLEAN & TIDY.WE HAVE BEEN COMING TO MIL PALMERIS FOR ABOUT 4 YEARS & WILL BE BACK NEXT YEAR. WEATHER WAS GOOD FOR WINTER . Clean,tidy ,Solarium as well as shared pool seconds away. All facilities as well as beach within reasonable walking distance. Will definitly return given the opportunity! Thank you Frank. I am happy that you liked the apartment. You are welcome to come back in the future. have been going to mil palmeras for 11 years lovely area, apartment good everything needed was there, only one concern no fire alarm and as bars up windows for security purposes an early warning of any fire is upmost. This pleasant Spanish style apartment is situated in the peaceful and attractive Riomar quarter of Torre de la Horadada. It is comfortable with a delightful terrace overlooking the shared swimming pool. Guests staying here will use their own key to access the pool. The apartment is modern and it is located 15 min walk/2 min drive from lovely, clean beach of Mil Palmeras and nearest supermarket. Other superb beaches are only short drive away. It is also a short drive to all amenities ,including bigger supermarkets, bars and restaurants. There are also tennis /football /basketball fields within walking distance. It is 20 minutes away from Murcia airport and 45 minutes from Alicante airport.Car hire is available at both airports. It is not essential, however if you wish to explore further afield it is recommended. Cleaning is carried out by owners after quests leave at cost of 50 Euros. Please contact the owner about the changeover days, arrival and departure times.Short stays and discounts in quiet months are also possible, however contact the owners.